If you follow me on Instagram then you know at least 2-3 mornings out of the week, I’m headed out the door for a 5 or 6 AM workout. Waking up extra early is NOT something I particularly look forward to, but the benefits of working out are paying off big time. Before heading out, I usually grab a banana and a bottle of water for my husband and me for the car ride. My gym bag stays in the trunk throughout the week, so I don’t have to worry about lugging that back and forth. 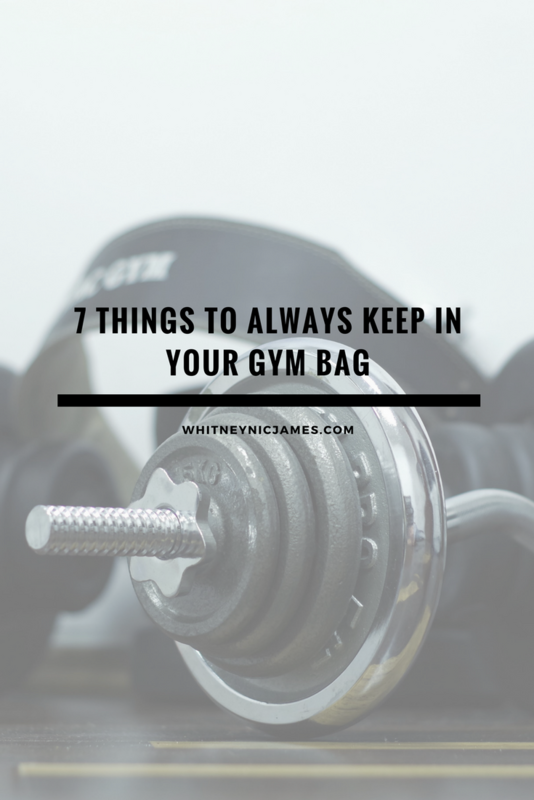 Keeping a gym bag in the car, or carrying one, is something I haven’t always done. However, now that working out has become part of my lifestyle, a fully loaded gym bag is a must-have. 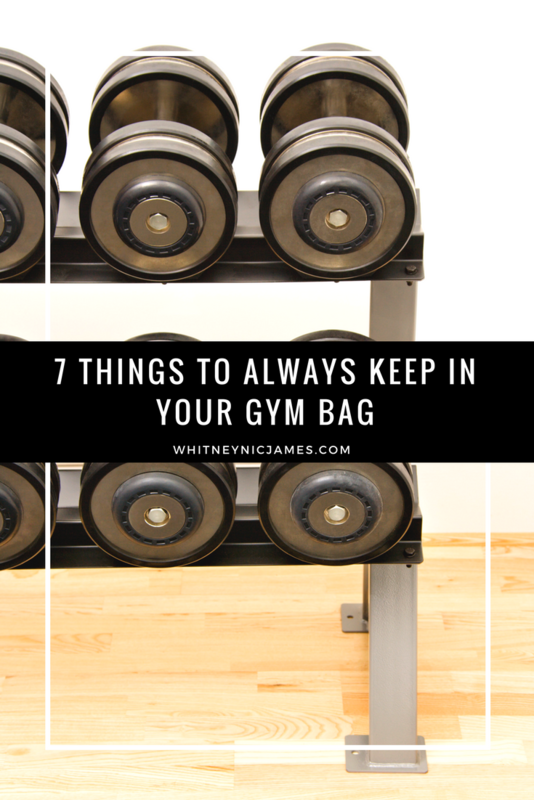 Read ahead to find out what 7 things I always keep in my gym bag. So tell me, what do you always keep in your gym bag? Let me know below! Earlier this summer I made the decision to take control of my health. 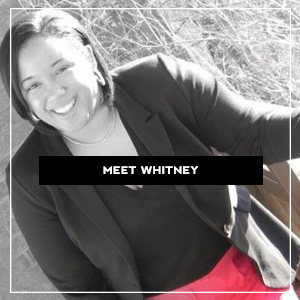 I was fed up with feeling sluggish, sick of getting bi-weekly migraines and I was over having zero energy. So, from the beginning of July to the end of September I began walking at least 1 mile 5 times a week, weekends included. I worked my way up to almost 3 miles and incorporated frequent Nike+ Training workouts into my routine. My progress was slow and steady and I was beginning to notice subtle changes in the energy, as well as the shape of my body. Unfortunately “life happened”. I found myself unable to dedicate much time to consistently working out. Instead I focused my energy elsewhere for a few months. Although it was necessary for me to do so, I really missed working out. Thankfully things have slowed down a bit, which means I can finally get back to my workout routine! I never thought I would miss working out. The feeling I get after I finish a 2 mile walk, as corny as it may sound, is amazing. I also feel a little pain and I’m usually exhausted, but finishing workout is an amazing feeling nonetheless. One thing that will definitely get me back on track is creating the perfect workout playlist. I cannot walk, run or do any type of exercise without good music. I usually separate my list into 3 parts – Warm Up, Workout & Cool Down. Different songs and tempos for each phase of my workout is a must. 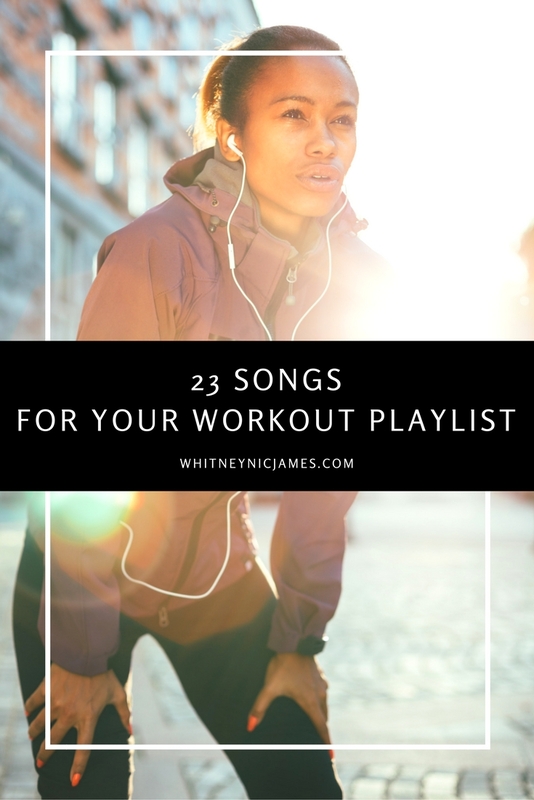 That said, here are 23 songs perfect for any workout playlist! Hello, Good Morning | Diddy – Dirty Money & T.I. So tell me, do you like my workout playlist? What are some of your favorite songs form your workout playlist? Let me know! As you can probably tell, I like to listen to a little gospel during my workouts. I find that hearing an uplifting song throughout my workout really keeps me going. Ending with a smooth jazz song is also something that may seem a little different. Because I usually end my workouts with stretching, I think it’s a perfect choice! Be sure to let me know what kind of music you listen to during your workouts; I’m always up for adding more songs. Until next time, be blessed and stay safe…XO!